Just a super quick post today to share with you all the great Weekly Deals. These Deals are always published first thing on a Wednesday morning and run through to10pm the following Tuesday night so this week deals end Tuesday 6th October. The deals this week are so good I've just been making loads of super cute bags with the MINI TREAT BAG DIE and now it's on a super discount of 25% off bring it down from £36 to £27. Also on offer this week is the GIFT BOARD PUNCH BOARD down from £18 to £13.50, ideal for all those little gifts you always need to buy a box for, well no more just make them with this great board. Here's just a few I made in 10 minutes. If you do want to order anything Septembers Hostess Code no is 3VMWPRFB. If you do fill in the hostess code you will receive a free gift. Please also tick the I would like contact section before you check out so I know where to send this months free gift and card. Ohh I have been having such fun with the new Square Pillow Box Thinlits Dies from Stampin' Up! It's such a great little box making tool and it's super quick to use. The Pillow Thinlits can be bought in a Bundle with a beautiful co-ordinating stamp set called A little Something. When you buy in a bundle you get a great saving of 15% off the two items which is such a great bonus. As you can see I've used the super cute Thinking of You stamp from the stamp set to pop on top of this little box. . The box finished measures 15.1 x 11.7 cm and I made it using the Big Shot and some of the lovely Winter Wonderland Speciality Designer Series Paper and a little piece of Gold Glimmer Paper, I hope you can see on the little strip of glimmer paper I've cut out little trees by using one of the cute little dies from the set. I popped the sentiment on some Whisper White and Hello Honey paper, cut out using the die cuts from the Thinlits set, they've thought of everything. I just loved the way the box was so quick to make and the Glimmer Paper makes it look extra special. I'm sure you're going to love this little die to so if you'd like to buy any of the products used to make this from me please click one of the items below and it will take you straight to my online shop I'm sure you'll be pleased with the finished box. Remember to add the Hostess code 3VMWPRFB to receive your free gift. If you spend between £20 and £150 I share all the Hostess Rewards that accumulate during the month with everyone that has spent in my online store. during the month. Over £150 the hostess rewards go directly to you to spend on whatever product you like, isn't that great. Please tick the I would like contact before you check out so I know where to send this months free gift and card. If you'd like your own paper copy of the Autumn/Winter catalogue or annual catalogue just let me know and I will send you a FREE copy. You can never have enough bags !!! 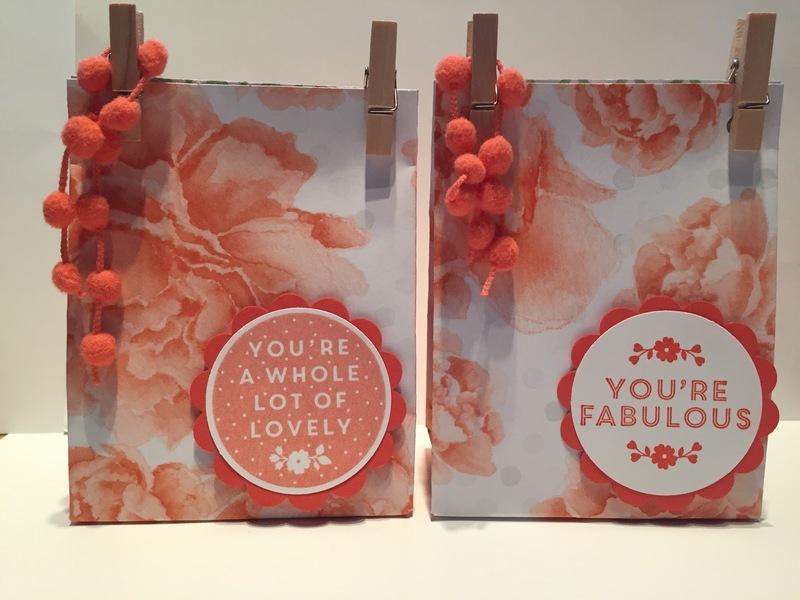 I am so in love with the Gift Bag Punch Board it's is so quick and easy to make lovely little gift bags for everybody and anybody that in under two minutes you have great gift bag already to go. I made these during the week but couldn't quite deicide which lovely sentiment to put on them. Stampin' Up! have so many lovely stamp sets that it's hard to chose between them. These sentiments are from a great Hostess Stamp Set called A whole lot of lovely. This exclusive hostess set is only available when you hold a party and have sales of £150 or over, or place an order of goods worth £150 or over. Your Stampin Rewards would convert into products and you can use them to purchase anyone of the great hostess stamp sets. I finally chose these two lovely sentiments for the front of my bags. There's some other lovely hostess sets all available at the back of the Annual Catalogue and some super cute Christmas Hostess stamp Sets available at the back of the Autumn/Winter Catalogue. So next time you have the catalogue in your hand check them all out and see what other sets are available. I have listed all the items used for this cute bag so if you would like anything just click on the link and remember to add the Hostess code club no 3VMWPRFB to receive your free gift. If you spend between £20 and £150 I share all the Hostess Rewards with everyone who has spend in the month in my online shop. Over £150 the hostess rewards go directly to you to spend. 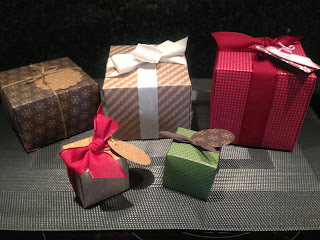 Please tick the I would like contact before you check out so I know where to send this months hostess gift. If you'd like your own paper copy of the Autumn/Winter catalogue or annual catalogue just let me know and I will send you out a copy FREE. Super Weekly Deals by Stampin' Up! Hi just a quick little post to share with you some of this weeks great Weekly Deals from Stampin' Up! There's two great punches on offer this week the Ornate Tag Topper Punch which makes super cute tags just ideal for this time of year. Also on offer is the lovely Handpicked Framelits Dies this look great when used to cut out a sentiments or a thank you to pop in a plant or gift as well as co-ordinating with one of our lovely stamp sets. All the items are available in my online shop you can just click on the link for the punch and it will take you straight to the shop. I hope you have a great day and come back soon for some more lovely ideas using Stampin' Up goodies. Remember to add the Hostess code club no 3VMWPRFB before you check out to receive this months gift also please tick the "I would like contact" so I know where to send your gift out to. I wanted to make a quick little package for some special gifts I'm sending out this month, so I used the super Mini Treat Bag Thinlits Dies by Stampin' Up! The thinlit comes with some extra cool dies included so you can cut out little stars or hearts, the word enjoy, a ribbon, a large heart or even a large star there's loads to chose from to make your bag look great. You could pop anything into the bags from a few sweets to a little gift for a that special person or occasion. I chose to use the lovely Neutrals Designer Series Paper which has the loveliest of papers and you get 40 double sided 12 x 12" sheets in a packet. I only had to use the one sheet to make these two bags. I added a bit of bling by using the Dazzling Diamonds Glimmer Paper to cut out a strip of stars, a little piece of Real Red Pompom Trim and finally the word enjoy with a small piece of Red Foil Sheet, and hay presto finished and ready to go to the lucky ladies. I hope you liked my bags and if you'd like to make them I've listed everything I used below, remember to add the Hostess code club no 3VMWPRFB before you check out to receive this months gift and please tick the you would like contact so I can send your gift out..
To You & Yours Shaker Christmas Card Kit from Stampin' Up! I held a card making class recently using the great To You & Yours Shaker Cards Project Kit from Stampin' Up! It's available now in the Autumn/Winter Catalogue. 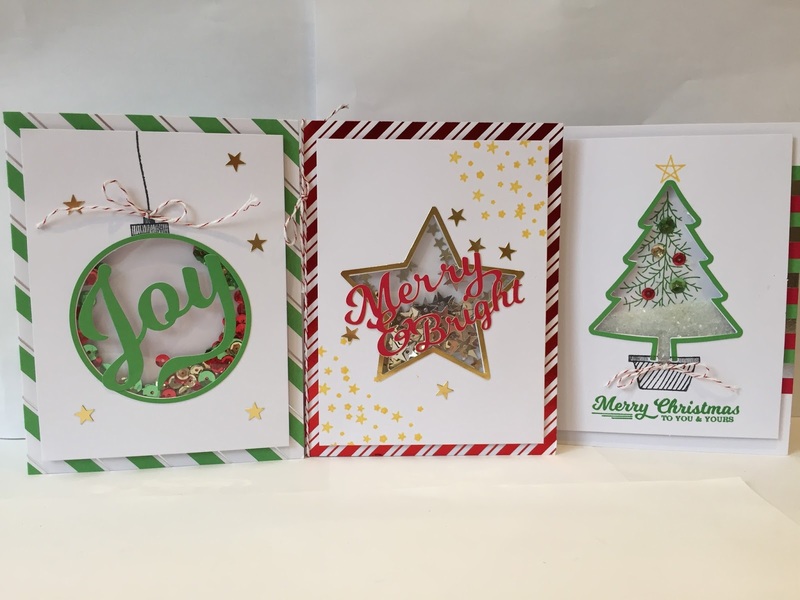 This kit is fabulous as it makes 18 shaker (where the snow and sequins move about inside the window sheet) cards 6 each of 3 designs. The kit includes printed foil bases, window sheets, self-adhesive foil stars, the word stickers "joy and merry and bright, sequins, dimensionals etc etc. The project co-ordinates with the stamp set To You & Yours Too which we used along with the kit. The whole kit was finished and completed by the end of the evening, with all the ladies thrilled with their finished cards. If you'd like to make this great kit I've listed everything we used below, remember to add the Hostess code club no 3VMWPRFB before you check out to receive this months lovely gift. If you'd like your own paper copy of the Autumn/Winter catalogue just let me know and i will send you out a copy FREE. Male Birthday Card using You've Got This from Stampin' Up! I've got a lovely male card for you today using a couple of great stamp sets from Stampin' Up! called Remembering Your Birthday and the background stamp from the set You've Got This. I used them both to make this super cute male card. 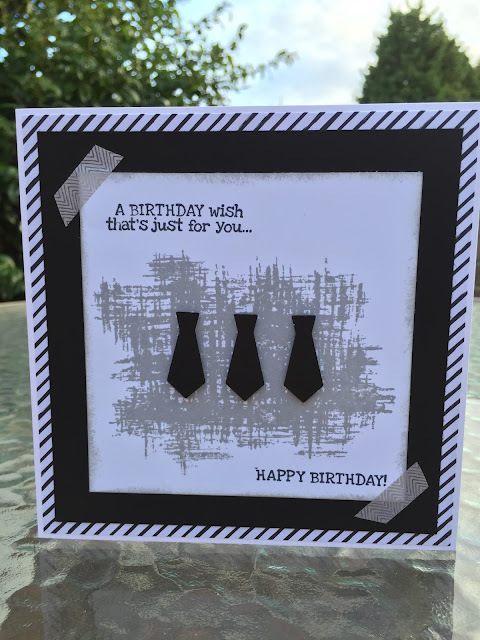 This card was so quick to make and I love how it turned out, I especially like the great little ties. These were made using the tie from the Baby's First Framelits Dies I think they look really good on this card and work perfectly. I placed them on top of the stamped image from the You've Got This stamp set and the paper in the background paper is from another favourite of mine the Go Wild DPS which is so good for a male cards as the paper have some lovely strong colours. If you would like a Stampin' Up! Annual or Autumn/Winter Catalogue please get in touch with me and I would love to send you out a copy FREE of charge. I have added all the items I have used to make this card at the bottom, and I always love to send my customers a thank you card when they purchase using my online website and if you use my September Code Club No 3VMWPRFB when you check out I will send you a special gift at the end of the month. Please tick the I would like contact section so I know where to send you gift. 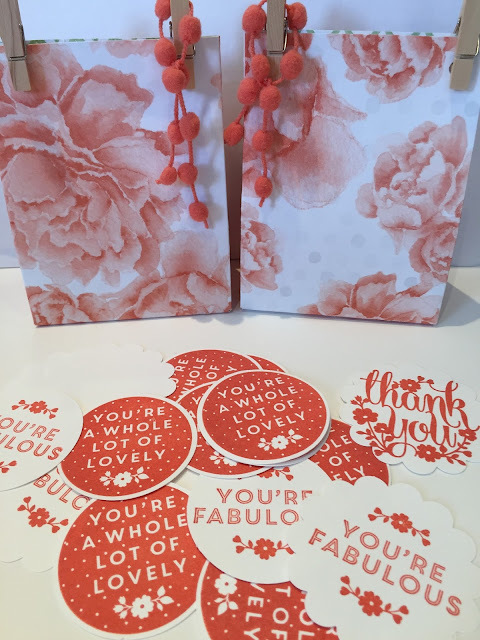 Super Cute Red Foil Sheets From Stampin' Up!